Was Monday’s Shake Up a “Temblor” or a “Terremoto”? 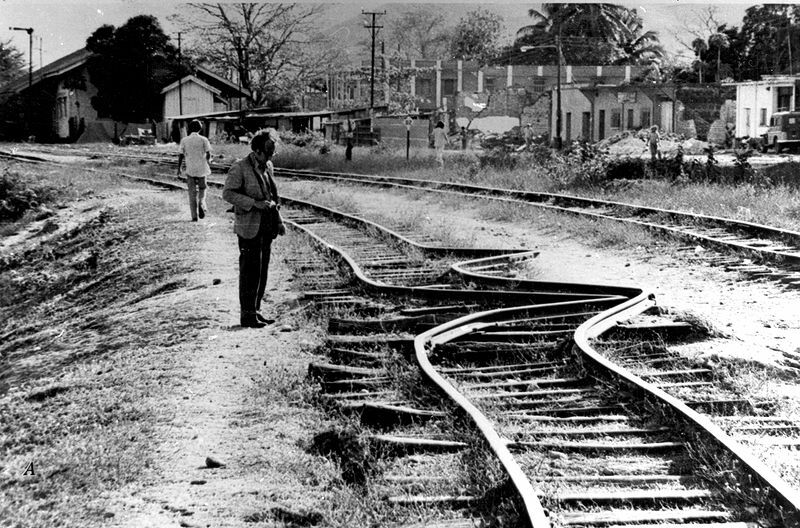 Guatemala Earthquake 1976. Rails bent in Gualan. 1976. Figure 42-A, U.S. Geological Survey Professional paper 1002. ‘Temblor’ es cuando tiembla la tierra, ‘terremoto’ es cuando causa mucho daños, como Haití. ‘Temblor’ viene derivado de que tiembla la tierra, pero terremoto causa muchos daños. “A ‘tremor’ is when the earth quakes, an ‘earthquake’ is when it causes much damage, such as Haiti. A ‘tremor’ is derived from the earth trembling, but earthquakes cause damage.” I tell her there is a technical difference. The Spokeseman Review and the USGS inform us that a “tremor is normally associated with movement of magma along with actual earth movement. Whereas earthquake is normally just earth movement.” Only scientists can really tell that technical difference, but in case you’re interested I found the USGS frequently asked questions to be really informative. But I was curious about mi abuelita’s experience of the 1976 earthquake, one year before I was born, and ingrained in my mind as this looming shadow of a chaotic time before the lights were even turned on in front of my eyelids. Pues, como fue el Terremoto del ’76 abuelita? “Allí estaba yo en las fincas. Había regresado de Chiquimula hasta el 3, y el 6 de febrero fue porque era el cumpleaños de tu tío Hugo. ¿Yo estaba en Chiquimula, porque la Lucky se quebrado la clavícula y una día antes habíamos ido a Esquipulas y me puse a pensar que tal si se calle la pared encima de nosotros? Y el otro día paso. So how was the Earthquake of ’76 Grandma? “There I was on the farm [United Fruit company banana finca]. I had returned from Chiquimula on the 3rd, and February 6th was when it happened because it was the birthday of your uncle Hugo. I was in Chiquimula, because Lucky had a broken collarbone and a day before we had gone to Esquipulas and I started thinking about what would happen if the wall fell down on us? And the next day it happened. ***Note about the picture: I chose the picture from Gualan because that is where mi abuelita’s family is from and the rails in Guatemala always lead back to United Fruit Company where my family worked for many generations. Posted on Monday, January 18th, 2010 at 8:51 pm. Filed under: Blog, Team Guate	RSS 2.0 feed. This is a lovely, personal and human post. After all we are a part of nature and our experiences of it. The common man’s and woman’s terms about nature and how they experience are intriguing and in many ways more important than any scientific measurement of the impact. They both serve a purpose, but ultimately the real life experience of the events following a nature force is what matters. I think the denotation “Temblor” and “Terremoto” shed light of how real people distinguish the impact and how to in a strikingly simple way categorize the effect. In many ways they are so direct and simple that I just by hearing them understood what they meant, yet hearing the Richter scale forced me to look up online what that magnitude meant. I am always astonished by the fact of people using simple, real words to describe their experiences that explain more and faster than most scientific scales. A genius way to put it in my mind. Muy interesante prima,mi amiga en la capital ya me habia contado un poquito del temblor,me dijo que se sintio un poco fuerte pero gracias a Dios no habia causado ningun dano,ella vive en la zona 17 creo que queda en la entrada si vas de izabal para la capital.de todos modos primita keep up the good work!! and thx for keeping us informed.